Case No. 1 — Major General Kirke Lawton — the commanding officer of the post at Ft. Monmouth — tried to fix the security problems he found there. He testified before McCarthy's committee that his efforts met with resistance and/or indifference "at higher levels," according to M. Stanton's brilliantly documented book Blacklisted by History. In the senator's executive closed-door hearings — released a half century later in 2003 — General Lawton told the committee that he had made a chart of security risks that he had sent up through channels to Washington. However, the general added that on the advice of John Adams — legal counsel to the Army Secretary who was present at the hearing — he was forbidden by a rule to disclose the number of security cases he had recommended for removal vs. those who actually were in fact removed. "I would love to tell you," Gen. Lawton added, "but I honestly feel that it is [a violation of the rules]." Senator McCarthy said he understood Lawton's position, but that "[i]t would be a good thing if the American people could learn that we have someone someplace who is kicking the Communists out." Lawton: I have been working for the past 21 months trying to accomplish [getting security risks out] what has been accomplished in the last two weeks. McCarthy: So that you would say that in the past several weeks you have been getting more effective results? Lawton: Absolutely, than we have gotten for the past four years. McCarthy: Could you tell us why it is only in the last 2 or 3 weeks that you have been getting effective results? Uh-oh! The general commits a boo-boo. He dares to imply that Senator McCarthy's pressure had something to do with the sudden activity. He will surely pay. The hearing was behind closed doors, but John Adams, counsel to Secretary Stevens, was present and he would make General Lawton an example of those who would not cooperate in a cover-up. Adams: I hope you can see your way clear to withdraw certain cases which you have recommended for removal as bad security risks. Lawton: I would not. Let the secretary take the responsibility. General Lawton further cooked his goose when he gave a supposedly off-the-record briefing to Monmouth workers in which he reportedly praised McCarthy for encouraging action on security cases and also for the senator's "fairness and courtesy" at the hearings. The remarks were leaked to the Asbury Park Press. Getting rid of those who do the bidding of our enemies and then compounding the offense by cooperating with a duly authorized Senate committee! Not a team player at all, General. Shame on you. Relieving General Lawton of his command would surely have given McCarthy a reason to raise the proverbial roof. But Washington has its ways of dealing with whistle-blowers without leaving fingerprints on the dirty deed. So, here's the plan: Tell the General to stop cooperating with McCarthy, put him on "medical disability," and then tell the world that General Lawton is still "in charge" at Monmouth. Visitors to his hospital room will say he seems to be in good health. But they won't have our megaphone. That script played itself out. McCarthy was held at bay when Pentagon forces told his staff that if the general did appear before the committee again, there would be more punishment — like losing the benefits he was to receive as a long-serving member of the Army. Once the heat was off, the Eisenhower administration finished the job. General Lawton was relieved of his command and the following year retired from active duty. His career was finished. Case No. 2 — General Ralph Zwicker, perhaps profiting from General Lawton's experience, took a different route when push came to shove. McCarthy's original tip on the doings at Ft. Monmouth included the suggestion that Camp Kilmer, also located in New Jersey, might be worthy of "some digging," to quote Stan Evans in Blacklisted by History. Following up on that and other tips, a McCarthy committee staffer, George Anastos, contacted the Kilmer commander, General Zwicker, who confirmed that a dentist — Dr. Irving Peress — was among the several suspects stationed there, and was scheduled to receive an honorable discharge. Let me digress: At the time of the ensuing uproar of the Peress case, one of McCarthy's critic said to me, "Look at all this fighting in Washington and what does he [McCarthy] come up with? A pink dentist." But as Evans points out, a dentist's office could be (and in fact had already been in previous spy cases) "a very good cover for clandestine operations, as all sorts of people might come and go there without attracting much attention." Secondly, the issue was lax security procedures, not about Peress per se. Last I checked, subversives supposedly were not eligible for U.S. military service. Third, Peress was more than a "pink dentist." He took the equivalent of the Fifth Amendment when asked about Communist Party membership. 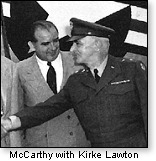 Before McCarthy's committee, he pleaded the Fifth Amendment when asked if he'd attempted to recruit any military personnel at Kilmer into the Communist Party, whether there had been Communist Party meetings in his home attended by one or more military personnel, whether he himself happened to be a member of the Communist cell at Camp Kilmer, and if he had organized a cell at the military base. Adams: "To hell with McCarthy"
McCarthy then fired off a letter to the Army — hand-delivered to the Pentagon — urging that the honorable discharge be canceled, and that Peress instead be turned over for court martial. As fate would have it, Secretary Stevens was out of town, so the letter fell instead into the hands of Army counselor John Adams. In his memoirs, Adams says he decided, "In short, to hell with McCarthy," and so the discharge was granted. Obviously, this whitewash left Senator McCarthy more than a little indignant. So he dispatched his committee staffer James Juliana to Camp Kilmer to interview the general. Juliana came back with a report to the senator that Zwicker would be an informative and friendly witness — that he opposed giving Peress an honorable discharge — especially given that it was Zwicker who had put the McCarthy committee on Peress's case in the first place. And this happened after the general had gone through channels to protest Peress's previous promotions. Juliana — the only known living McCarthy staff person — recently repeated the account of his experience to author Stan Evans who was preparing Blacklisted by History. The night before he was to appear before the committee, Zwicker received "a flying visit" from Army counsel Adams who specifically told him to back off. Adams acknowledged as much in his later book Without Precedent, which was published in 1983 — nearly three decades later after the damage was done. Unlike General Lawton, the "team-playing" General Zwicker folded like a cheap umbrella. The next day at the hearing, McCarthy was not in his best form. His wife had been in a car accident the day before, and he had spent hours with her at the hospital until the wee hours and again on the day of Zwicker's scheduled appearance. When he arrived for the hearing looking frazzled, his staffers wanted to postpone the session. But the senator insisted on going through with it. That turned out not to be to his advantage. When Zwicker took the witness chair, he hemmed and hawed as if he had become a totally different person. He verbally fenced with McCarthy, refusing to answer many questions, claimed he didn't know about Peress's Red connections, and even said he didn't know about the well-publicized fact that Peress had taken the Fifth Amendment. The cat-and-mouse game went on until finally McCarthy asked him if a hypothetical general who signed the order to grant a security risk an honorable discharge should be kept in the military. Zwicker responded, "I do not think he should be removed from the military." Whereupon, McCarthy finally "lost it," and fired a volley at the general that would haunt the senator in his upcoming battle to fend off attacks from his determined enemies. Said he, "Then, general, you should be removed from command," adding that any general willing "to protect another general who protected Communists is not fit to wear that uniform, General." M. Stanton Evans is super cautious in his book — understandable when you're crossing every "T" and dotting every "I" in making the case for the most reviled U.S. Senator of the 20th Century. Accordingly, in my own interview with Evans — as well as in his book — he declines to go for the jugular, preferring to let the facts speak for themselves (facts which are not only convincing, but airtight). He does say that neither Zwicker nor McCarthy covered himself with glory at the hearing. Though the author believes McCarthy went over the line in telling a general he was not fit to wear his uniform, he also believes Zwicker gave the senator plenty of provocation. In our interview, Evans also declines to make the flat charge that Zwicker committed perjury. Again, the reserve is understandable given his position. But when considering the hearing transcript and bearing in mind what we know about the Anastos and Juliana interviews, others — including this column — can read the hearing transcript and find it difficult to avoid the conclusion that General Zwicker was lying. If the general had been warned that telling the truth would damage his career, he could have asked his superiors to pass that word to the committee — as was done in General Lawton's case. McCarthy never called Lawton back to testify once he was warned that to do so would jeopardize the general's standing — benefits and all. So McCarthy loses his temper while General Zwicker loses his integrity. Which is worse? The reader can decide, even if one does not justify the other. The investigation did not end there. The following year (1955), the committee — by then under Democrat control and chaired by Senator John McClellan (D-Ark.) pursued the case and referred Zwicker's testimony to the Justice Department for consideration of perjury charges. Ike's Justice Department took 19 months to respond and finally decide that (surprise!) the referral did not meet the "technical" requirements for a perjury indictment. On January 17, 1957, General Zwicker was nominated for promotion to full rank as brigadier-general and temporary major general. 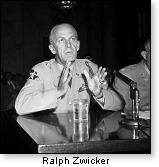 At his confirmation hearing, the general was accompanied by Ike's new Army Secretary Wilber Bricker and "a full array of Pentagon brass," according to Blacklisted by History. The promotion zipped through the Senate.